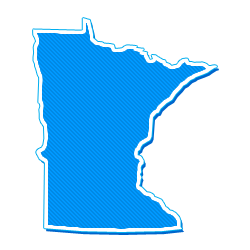 The Minnesota Permit to Carry Class is designed for persons that already have an Iowa Permit to Carry who wish to legally carry a weapon when traveling in Minnesota. Upon successful completion of this course, the student will receive a certificate that will enable them to apply for a Minnesota Permit to Carry. Reasonable force and deadly force as defined by Minnesota statues. To pass, students must score a minimum of 80% or 32 of the 40 rounds inside the white silhouette. Participants will be given up to two attempts to pass the shooting test. Students will be disqualified for any safety violation. Required Items: Eye and ear protection are required. Students may bring centerfire double-action revolver or centerfire single action/double-action semi-auto pistol. Handguns are available to rent for an additional charge. Students will need to bring/purchase a minimum of 40 rounds of brass cased ammunition. Prerequisites: Must be 21 years old or older and possess a valid Iowa Permit to Carry. Must be able to demonstrate safe handgun handling skills. Cost: $89.99 plus tax per person. To register, please stop in or call the store during business hours.